Less than a week before Christmas and you still don't have a tree skirt? No problem. You can make a no-sew, fast and frugal tree skirt in a flash. 1 yard of 36" wide felt, your choice of color. Start by folding your felt in half. Mark and then Cut a half circle almost the size of the fabric. (I used a pencil on a string to act as a huge compass to lightly mark a half circle on my fabric). Cut a smaller half circle from the middle of the fabric. I made the diameter of that smaller circle about 8" as that is the size of the water well on my tree stand. You could make yours smaller or bigger as needed. Make one straight cut from the center to the outside edge of the fabric. This will allow you to put the skirt around your tree. 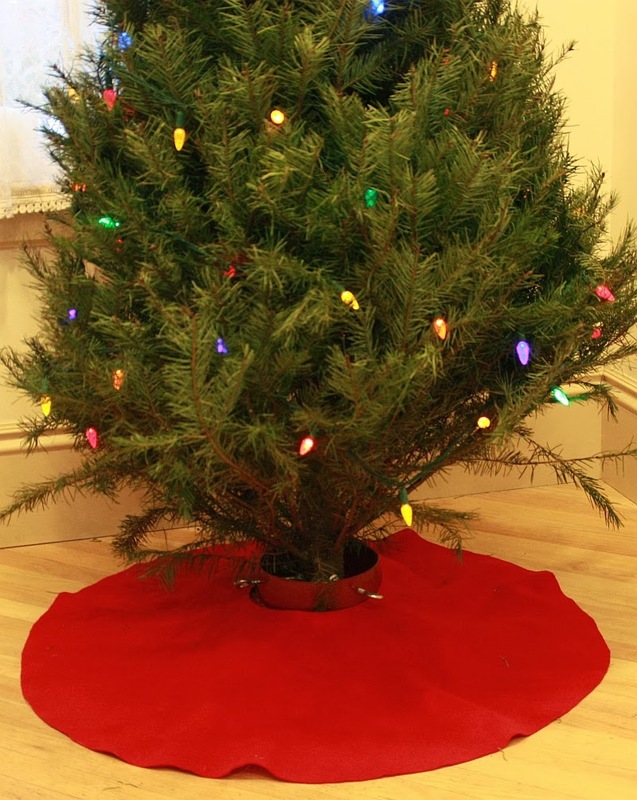 Place skirt around the base of your Christmas Tree. Ta Da! Simple, fast, and frugal. If you desire, decorate to match your decor.